TOURING ONLY – Theatre Yes’s National Elevator Project – 16 very short plays written for and performed in working elevators – continues to perform and tour in Edmonton and across the country at events and festivals. Theatre Yes partnered with 14 local and national theatres, play development centres, and festivals who provided the funds to commission 16 playwrights to write 5-10 minute plays that explore the ritual of the elevator ride. The NATIONAL ELEVATOR PROJECT is utterly unique in content, structure and execution. Magnetic North Theatre Festival, Mulgrave Road Theatre, Eastern Front Theatre, Artistic Fraud, Playwrights’ Atlantic Resource Centre, Imago Theatre, Nightswimming Theatre, Persephone Theatre, Canadian Centre for Theatre Creation, L’Unithéâtre, Shadow Theatre, Workshop West Playwrights Theatre, Ghost River Theatre and Rumble Productions, agreed to provide commission funds for Canadian playwrights to contribute to the project. Participating playwrights represent every province in the country and include both award-winning seasoned professionals and lauded up-and-comers from across the country. Participating playwrights are: Catherine Banks (Sambro, Nova Scotia), Ryan Griffiths (Fredericton, New Brunswick), Rob Maclean and Melissa Mullen (Lewes Prince Edward Island), Meg Coles (St. John’s, Newfoundland), Brad Fraser (Toronto) Jordi Mand (Toronto), Greg Macarthur (Montreal), Alexandra Haber (Montreal), Rick Chafe (Winnipeg), Kenneth T. Williams (Saskatoon), David van Belle & Eric Rose (Calgary), Jason Chinn (Edmonton), Melissa Thingelstad (Edmonton), Donia Mounsef (Edmonton), Kendra Fanconi (Vancouver), Peter Boychuk (Vancouver). The plays invite audiences to enter elevators with actors providing, distinctive, hyper-intimate theatrical experiences which developed themes of transformation in which elevators are both location and metaphor for the moments in our lives in which we are changed irrevocably. These are works built to capitalize on the restrictions and opportunities elevators create. They use the uneasiness which people feel sharing confined public spaces to open up and expand the boundaries of what audiences believe theatre can be. 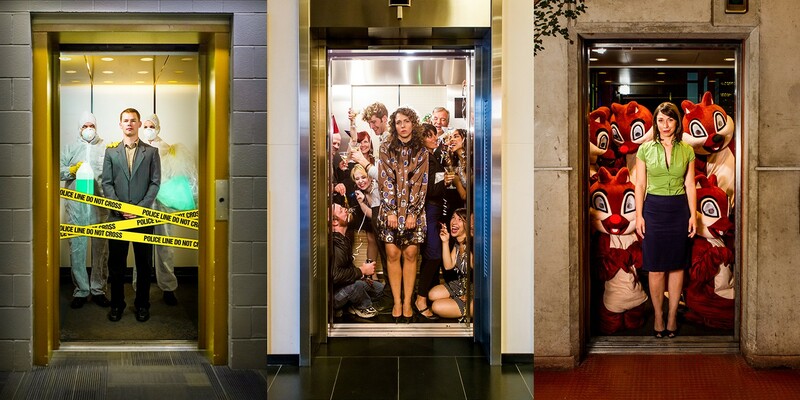 The NATIONAL ELEVATOR PROJECT creates exciting real-time, real-space connections between artists and audiences from across the country, valuable opportunities for audiences to look outward to find links between themselves and other Canadians. The plays are now available for booking at arts events and festivals locally and across the country. The project has been performed at The Canoe Festival (Edmonton), The Skrits Afire Festival (Edmonton), The Magnetic North Festival (Halifax), Le Grand Maché des Arts (Edmonton), Fem Fest (Winnipeg) and the High Performance Rodeo (Calgary) and the Banff Centre for the Arts. The National Elevator Project was conceived and created by Heather Inglis, co-curated by Melissa Thingelstad and Designed by Brian Bast. For more information about touring click here.